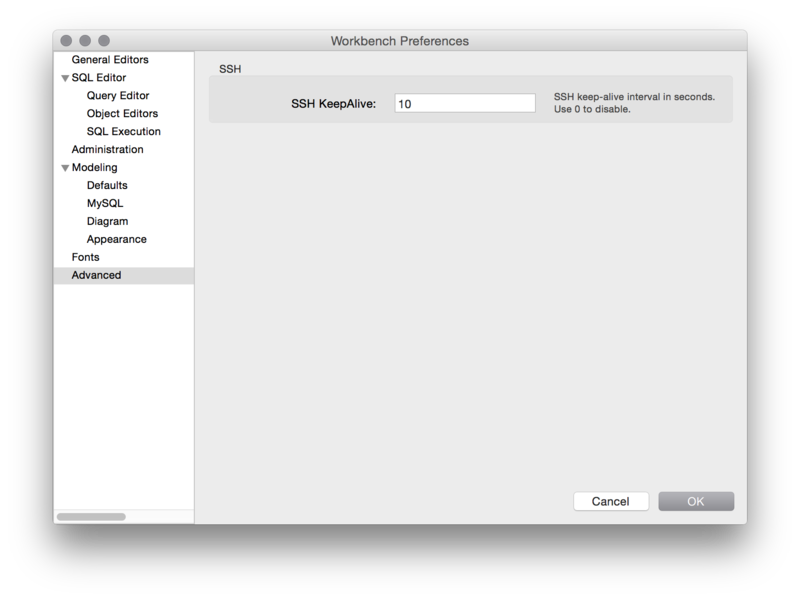 I am using MySQL Workbench. Also, I am running a batch of inserts, about 1000 lines total (Ex. INSERT INTO mytable SELECT * FROM mysource1; INSERT INTO mytable SELECT * FROM mysource2;...mysource3...mysource4 multiplied 1000 times) Each batch takes a considerable amount of time, some of them, more than 600 seconds. How can I configure workbench, to continue working overnight, without stopping and without losing the connection? Go to Edit -> Preferences -> SQL Editor and set to a higher value this parameter: DBMS connection read time out (in seconds). For instance: 86400. Close and reopen MySQL Workbench. Kill your previously query that probably is running and run the query again. The latter is where you'll want to up the limit from 600 to something a bit more. In my case after trying to set the SSH timeout on the command line and in the local server settings. @Ljubitel solution solved the issue form me. 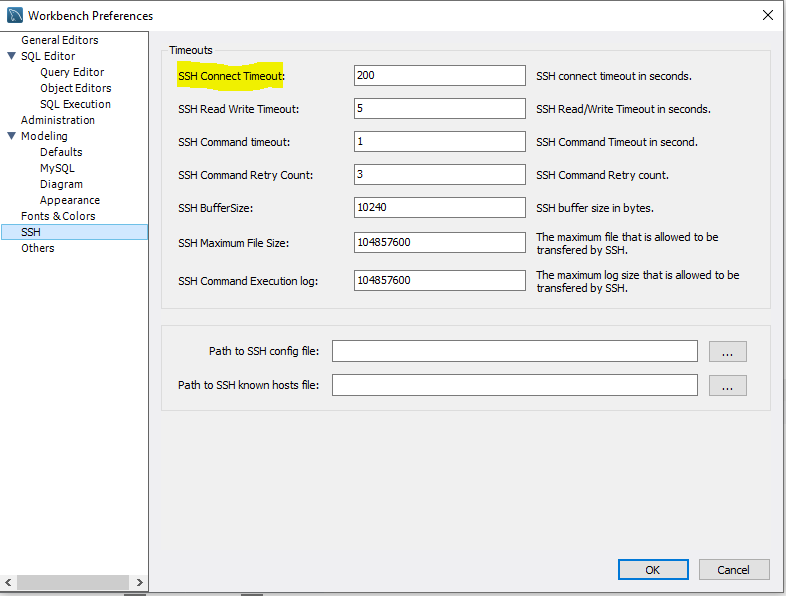 If you are using a "Standard TCP/IP over SSH" type of connection, it might be the ssh server that keeps timing out, in which case, you would have to edit TCPKeepAlive related settings in /etc/ssh/sshd_config on your server. I was getting this error 2013 and none of the above preference changes did anything to fix the problem. I restarted mysql service and the problem went away. OK - so this issue has been driving me crazy - v 6.3.6 on Ubuntu Linux. None of the above solutions worked for me. Connecting to localhost mysql server previously always worked fine. Connecting to remote server always timed out - after about 60 seconds, sometimes after less time, sometimes more. What finally worked for me was upgrading Workbench to 6.3.9 - no more dropped connections. Not the answer you're looking for? Browse other questions tagged mysql sql mysql-workbench connection-timeout or ask your own question. How to keep connection without lost in mysql from server side?